Yesterday afternoon was spent at the beauty parlor. It was time for a hair cut and I have them give her a body wave, too. Mom seemed confused about the whole experience at the time. 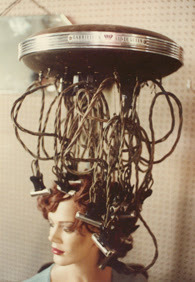 She didn't seem to remember the hairdressers who have done her hair for 20 years. Today, however, she remembered a great deal about the whole experience. The new hairdo will be much better to manage with the heat and humidity we've been having lately. I've been reading your blog recently and wanted to tell you that I understand how it is to see someone you love deteriorate cognitively. I'm caring for my partner of many years who has HIV-related dementia, PML, and a host of other neuro conditions. God bless you for being there for your mom. Most people that I've met would not do that for their partner or their parent.